Captain Charles, somewhat of a recluse who lived on this beautiful old boat for 7 years until it sank and is now forced to rely on the kindness of strangers. He was living his dream and now that has been altered. The Jean, when launched in 1913 was a wooden gas screw small passenger vessel. She is made of white cedar and white oak. The Jean is the last of her kind. She is the only family cruiser known to exist that was originally built to use the 2-stroke engine instead of steam, naptha or sail. The Jean is a living record for the earliest beginnings of the motor cruiser era. She is an excellent example of a glass cabin motor cruiser. Charles Allan, a farmer, banker and community leader from Red Bank NJ, with no formal education in boat building built The Jean. 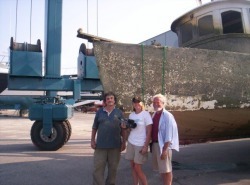 Eldo Hartz became the 7th owner of the Jean after purchasing and salvaging her from the banks of the Savannah River. The Jean is currently undergoing restoration behind the Carbo House on Tybee Island, GA where she will become a permanent resident as a Maritime museum/oyster bar.